This design was primarily intended to allow automatic switch-on of push-bike lights when it gets dark. Obviously, it can be used for any other purpose involving one or more lamps to be switched on and off depending of light intensity. Power can be supplied by any type of battery suitable to be fitted in your bike and having a voltage in the 3 to 6 Volts range. The Photo resistor R1 should be fitted into the box containing the complete circuit, but a hole should be made in a convenient side of the box to allow the light hitting the sensor. Trim R2 until the desired switching threshold is reached. The setup will require some experimenting, but it should not be difficult. In this circuit, the maximum current and voltage delivered to the lamp(s) are limited mainly by R6 (that cant be omitted if a clean and reliable switching is expected). Therefore, the Ohms Law must be used to calculate the best voltage and current values of the bulbs. At 3V supply, R6 value can be lowered to 1 or 0.5 Ohm and the operating voltage of the bulbs should be chosen accordingly, by applying the Ohms Law. 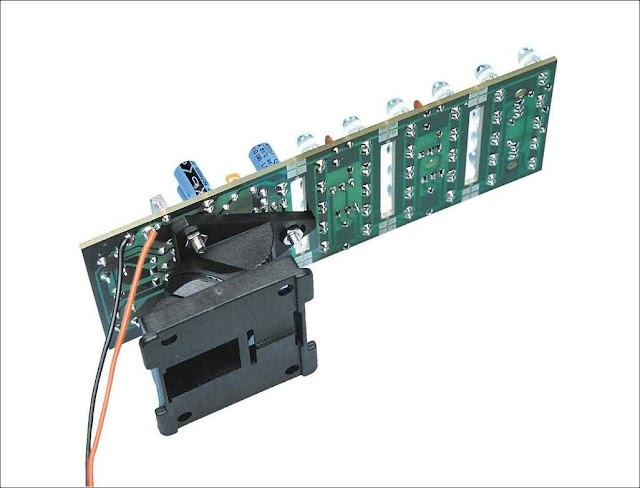 This circuit is a video line driver specifically intended for use with a single-ended power supply. 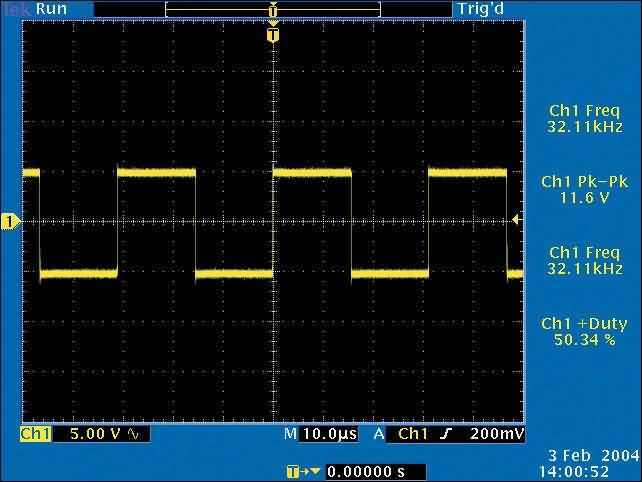 As a matter of fact, the synchronised outputs of a line driver for composite-video signals go negative with respect to ground. In order to be able to process these negative signals in a circuit powered from a single-ended supply, it is necessary to AC-couple the input of the opamp as well as level-shift the signal in the positive direction. The input is terminated into a 75 Ω resistor (R1). From here, the signal passes through AC-coupling capacitor C2 and is applied to potential divider R2-R3, which provides the necessary DC-offset. The shift into the positive direction amounts to +1.7 V, with the values shown in the schematic. To avoid any misunderstandings we should add that this value is fairly critical. Deviating from the values shown can lead to distortion in the complementary input stage of the opamp that has been used here, and this of course, has to be avoided. Because we provided the circuit with its own voltage regulator circuit (IC2), just about any mains adapter will suffice for the power supply. The current consumption is less than 20 mA. The construction of the line driver using the accompanying printed circuit board layout is no more than a simple, routine job. The digital lock shown below uses 4 common logic ICs to allow controlling a relay by entering a 4 digit number on a keypad. The first 4 outputs from the CD4017 decade counter (pins 3,2,4,7) are gated together with 4 digits from a keypad so that as the keys are depressed in the correct order, the counter will advance. As each correct key is pressed, a low level appears at the output of the dual NAND gate producing a high level at the output of the 8 input NAND at pin 13. The momentary high level from pin 13 activates a one shot circuit which applies an approximate 80 millisecond positive going pulse to the clock line (pin 14) of the decade counter which advances it one count on the rising edge. A second monostable, one shot circuit is used to generate an approximate 40 millisecond positive going pulse which is applied to the common point of the keypad so that the appropriate NAND gate will see two logic high levels when the correct key is pressed (one from the counter and the other from the key). The inverted clock pulse (negative going) at pin 12 of the 74C14 and the positive going keypad pulse at pin 6 are gated together using two diodes as an AND gate (shown in lower right corner). The output at the junction of the diodes will be positive in the event a wrong key is pressed and will reset the counter. When a correct key is pressed, outputs will be present from both monostable circuits (clock and keypad) causing the reset line to remain low and allowing the counter to advance. However, since the keypad pulse begins slightly before the clock, a 0.1uF capacitor is connected to the reset line to delay the reset until the inverted clock arrives. The values are not critical and various other timing schemes could be used but the clock signal should be slightly longer than the keypad pulse so that the clock signal can mask out the keypad and avoid resetting the counter in the event the clock pulse ends before the keypad pulse. The fifth output of the counter is on pin 10, so that after four correct key entries have been made, pin 10 will move to a high level and can be used to activate a relay, illuminate an LED, ect. At this point, the lock can be reset simply by pressing any key. The circuit can be extended with additional gates (one more CD4011) to accept up to a 8 digit code. The 4017 counting order is 3 2 4 7 10 1 5 6 9 11 so that the first 8 outputs are connected to the NAND gates and pin 9 would be used to drive the relay or light. The 4 additional NAND gate outputs would connect to the 4 remaining inputs of the CD4068 (pins 9,10,11,12). The circuit will operate from 3 to 12 volts on 4000 series CMOS but only 6 volts or less if 74HC parts are used. The circuit draws very little current (about 165 microamps) so it could be powered for several months on 4 AA batteries assuming only intermittent use of the relay. 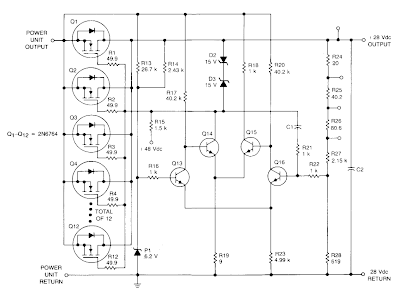 Build a Bootstrapped Amp Current Source Circuit Diagram. This circuit responds to the difference between Vj and V2. Rq on sets gain. Resistors XR2 and (1 -X) R2 produce the bootstrap effect. 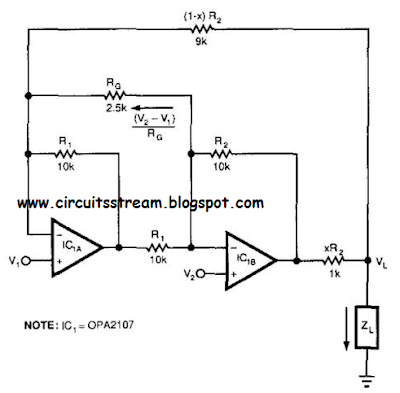 These two resistors convert the circuit`s output voltage to a current. IC1 and IC2 are Burr-Brown OPA2107 or equal. This is Simple linear Regulator Circuit Diagram. Intended for extreme temperature, radiation-hardened environments, this linear supply is capable of supplying 28 Vdc at 125 A from an ac-driven power unit. In operation, power supply output voltage is sensed by the voltage divider consisting of R24 to R28 and fed to one input of a discrete differential amplifier composed of Q13 through Q16. The other input of the amplifier is connected to a radiation-hardened zener diode, Dl. Local feedback using R21 and Cl produces gain to phase shift that are independent of individual component parameters, which provides stable operation into the required loads. While we have now published quite a few LED driver circuits, to date we have not published a design to drive a bunch of high-brightness white LEDs. Such a circuit is now quite desirable as the price of white LEDs has fallen and you can have a handful for not a lot of dollars. However, white LEDs do present a problem because they need a higher drive voltage than monochromatic types such as red, green, orange etc. Instead of around 1.8V to 2V or thereabouts, they normally require more than 3V to produce their rated brightness. In fact, if you are driving a bunch of them you need to drive them all at constant current otherwise their individual brightness tends to vary markedly. However, if you only have a 12V supply available, you can only put two or maybe three LEDs in series together with a constant current source and this leads to poor efficiency. The approach in this circuit is to boost the 12V supply to something around 21V and this means that we can have groups of five LEDs, each in series with their own current source transistors. The result is a single PC board with the drive circuitry and 30 white LEDs. It can be used for lighting in caravans and recreational vehicles, emergency lighting or whatever application you can think of. Current drain is around 190mA at 12V. 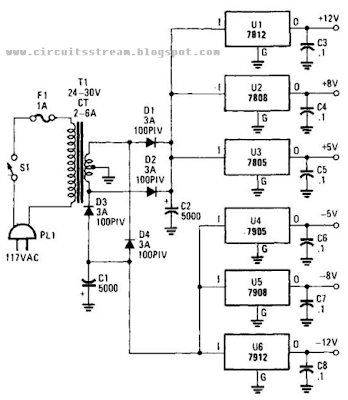 IC1c is connected as an inverter oscillator and its running frequency of about 30kHz is determined mainly by the 6.8kΩ resistor between pins 8 & 10 together with the 4.7nF capacitor at pin 8. This produces a rectangular waveform (not quite square but pretty close) at pin 10 to drive complementary switching transistors Q2 & Q3. The waveform at their commoned emitters drives a diode pump consisting of two 100μF capacitors and Schottky diodes D1 & D2. The waveform generated by the circuit can be seen in the scope photo of Fig.2. Oscillator IC1c is controlled by an RS (Reset/Set) flipflop comprising the two NAND gates IC1a & IC1b and this is controlled by pushbutton switches S1 and S2. Normally, this has its pin 4 low and pins 1 & 6 are pulled high via 470kΩ resistors. Momentarily closing S1 (ON) pulls pin 6 low, causing the flipflop to change state so that pin 4 now goes high to enable IC1c which now oscillates at 30kHz. The 30kHz waveform produced by transistors Q2 & Q3 drives the diode pump referred to earlier and this develops about 21V to drive the LED columns. Each column of five white LEDs is driven by its own current source transistor which has a 33Ω emitter resistor. The bases of all six current source transistors (Q4-Q9) are driven from pin 4 of IC1b via a 6.8kΩ resistor and clamped to a maximum of +1.2V by diodes D3 & D4. Subtract the 0.6V between the base and emitter of each transistor and you are left with 0.6V across each 33Ω resistor, thus setting the LED drive current to 18mA. Switching the circuit off is accomplished by pushing the OFF switch, S2. This momentarily pulls pin 1 low to toggle the RS flipflop, thus causing pin 4 to go low. This disables IC1c, Q2 & Q3 and also turns off the current source transistors. Note that there is an interesting wrinkle to this drive circuit, because there is no On/Off switch. This means that the current source transistors must be turned off otherwise they would continue to draw current from the 12V supply even when the circuit is nominally off. The current path may not be obvious but it is via the boost circuit’s diodes, D1 & D2. As well as using the pushbutton switches S1 & S2 to turn the circuit on and off, there is also a facility to automatically turn the circuit on and off depending on ambient light levels. Links L1 & L2 can be used to provide Auto On and Auto Off respectively and these features can be used separately or together. An LDR (light dependent resistor) is used to monitor the ambient light level. When light falls upon it, it pulls the base of Q1 low, causing pins 12 & 11 of IC1d to go low and its pin 11 to go high. When darkness falls (or the room lights go out), the process is reversed. Depending on whether you have one or both links connected, you can use the pushbuttons to turn the circuit on and off and have it turn on and/off automatically as well. Q1 also drives a red high brightness LED (LED1) at very low current, via a 470kΩ resistor. This is a bit of a gimmick but it does have the benefit of showing that this part of the circuit is working, if you have to trouble-shoot it. Pins 1 & 2, 5 & 6 and 8 & 9 of IC1 on the circuit are all swapped. The PC board overlay diagram is correct. This dual-polarity, multivoltage power supply circuit diagram can be built for a very small investment. The circuit is built around 78XX and 79XX series i-A voltage regulators, four 3-A diodes, a 24-30-V 2-6-A transformer, and eight filter capacitors.